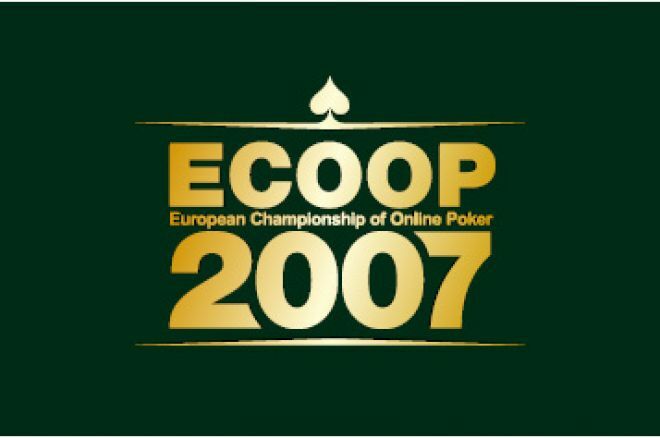 The main event at the European Championship of Online Poker (ECOOP) took place on Sunday 9th December at Titan Poker. 992 players participated in this $1000 + $60 No Limit Hold'em Freezeout event. Total buy-ins were $992,000, house contribution was $8000 and the total fees were $59,520.The tournament took a gruelling 13 hours to complete and the final table was reached at 7.06am. The eventual victor was "wllkllu", who won an impressive total of $220,000.00. The first decisive hand on the final table involved "JonnyTCash" and "Thi55555". After the blinds, the next seven players folded before "JonnyTCash" raised 60,000 with his . "Thi55555" made a huge re-raise of 290,000 from the small blind with . The big blind folded. "JonnyTCash" made his move, going all-in to be called by "Thi55555". The flop came down giving both players the Ace but "Thi55555" the better kicker. There was no help for either player from the turn or river, eliminating "JonnyTCash" in 10th place and giving "Thi55555" the pot of 917,529.08. The next player to go was an unlucky "folter". There was a pre-flop raise by "wllkllu" for 60,000 with which was called by "folter" with . The flop came down giving "folter" a pair of Kings and the advantage. However, holding a strong pocket pair, "wllkllu" came out firing with a 90,000 bet, flat called by "folter". The turn card was making a four part flush for "wllkllu" who bet out for 200,000. At this stage "folter" had a lot of chips in the middle and went all-in, which was called by "wllkllu". He hit his dream card on the river which eliminated "folter" in 9th place and took down a pot of more than a million in chips. More than half an hour elapsed before the final table lost its next player in 8th place. The contest was between "PoKerArt1" and "Thi55555". The short stacked and first to act "PoKerArt1" made a pre-flop raise all-in with which was called by "Thi55555" in the big blind with . The flop came down giving "PoKerArt1" a pair of jacks. The turn card was giving "Thi55555" his pair of aces and the river was a blank for both players. "PoKerArt1" was eliminated in 8th place and "Thi55555" scooped the pot of 130,622.08. A couple of minutes later it was the turn of new shortest stack "7bratov" to be sent to the rail by "Shejky". Immediately after the blinds "7bratov" went all in for his remaining 79,712.12 with which was raised 134,424.24 by "Shejky" with . All remaining players folded leaving two to see the flop of making two pair for "7bratov" who was looking good at this stage. The turn card was helping neither player but the decisive river card was giving "Shejky" a stronger two pair. "7bravtov" was eliminated in 7th place with the pot of 251,636.36 going to boost the "Shejky" coffers. However, this good fortune didn't last long when "wllkllu" raised 62,500 from the small blind with and "Shejky" called from the big blind with . Both players checked the flop of having hit an ace. There was further betting action on the turn card with a 100,000 bet from "wllkllu" being re-raised all in by "Shejky". The on the river helped no-one and Shejky" was eliminated in 6th place with the massive pot of more than a million in chips sliding along the table to "wllkllu". The next player to hit the rail was the short stacked "Rudan" who went all in before the flop with a small pocket pair . The all-in was comfortably called by "AKMALAK" in the big blind also with a smallish pocket pair . There was an 8 on the flop of giving "AKMALAK" trip 8's and both the turn and the river were blanks for "Rudan" who was eliminated in 5th place. Shortly after the elimination of "Rudan", it was the turn of the now short stacked "AKMALAK" himself to leave the table. There was a pre-flop raise from "shaffAA" with (AC} and then "AKMALAK", who was down to his last few chips after posting the big blind, went all-in with . After the flop drew a blank for both players, "shaffAA" hit on the turn and a on the river saw "AKMALAK" leaving the tournament in 4th place with the pot of 79,010.81 going to "shaffAA". The next decisive hand saw action between "shaffAA" and "Thi55555". The initial raise was made by "Thi55555" for 90,000 with , "wllkllu" folded and "shaffAA" in the big blind called with . The flop of was checked by "shaffAA" who had made a pair of jacks, but a raise from "Thi55555" of 100,000 soon followed, having made two pair. The turn card was which elicited a raise of 180,000 from "shaffAA" with an open ended straight draw. The call was made by "Thi55555" before the river card, a was revealed. Having committed a lot of chips to the pot already, "shaffAA" went all in for 467,455.57 which was called by the large stack "Thi55555". His hand held up and "Thi55555" eliminated "shaffAA" in third place.